BAYONNE, N.J, – Leasing will officially launch this weekend (April 26th & 27th) at SilkLofts, a historic Bayonne, NJ landmark reimagined as an exciting new collection of Brooklyn-style loft apartments. SilkLofts embodies the ideal combination of dramatic architectural elements more than 100 years old and modern finishes and appointments which results in 85 remarkable studios, one- and two-bedroom residences with soaring living spaces in a location convenient to Manhattan. 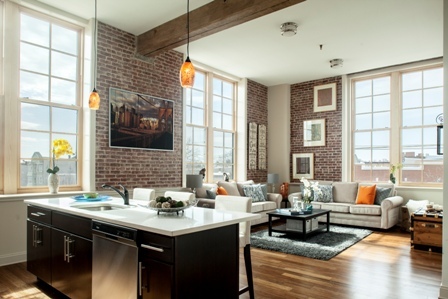 Two fully-furnished model homes help demonstrate the unique character of the lofts. Initial occupancy is scheduled for June, 2014. SilkLofts consists of three interconnected, five-story buildings located at the intersection of 18th Street and Avenue E – just 800 feet from the 22nd Street Light Rail station and minutes from NYC, Jersey City, Hoboken and other Gold Coast locations. A fourth building overlooking an interior courtyard will feature a limited offering of Artist lofts. Homes offer modern living spaces and amenities while retaining dramatic original structural elements. A variety of floor plans are offered at SilkLofts ranging from 568 to more than 1,300 square feet of living space. Masterfully designed to reflect its historic roots, homes will combine 19th century restored elements that represent the building’s past – such as exposed heavy timber columns and brick – with modern finishes and appointments that innovatively meld it into the 21st century. Monthly rental rates will begin from $1,800. A mix of old and new will be found throughout the loft residences, including soaring 12-to-20-foot ceiling heights, mahogany front doors, exposed brick and wood beams, bamboo and oak gunstock wood floors, gourmet kitchens with Quartz countertops and Chef Islands, and washer and dryers. Bathed in natural light through newly-installed, oversized energy efficient argon filled factory windows, the residences offer a variety of views, including the New York City skyline and Bayonne Bridge. A creative suite of amenities has been specifically designed for SilkLofts to foster a close-knit atmosphere. An outdoor, landscaped pocket park will feature an herb garden, barbeque, fire pit and pizza oven. There will also be an on-site fitness center, secured on-site parking and a welcoming lobby with historic photos of the original Maidenform factory. Situated just two blocks from the Hudson-Bergen Light Rail’s 22nd Street Station, SilkLofts offers a prime location in a city that’s well known for its strong sense of civic pride, low crime, outstanding schools, and neighborly atmosphere. The building is widely recognized as a linchpin for a new kind of urban living in Bayonne focusing on easy access to public transportation, highly-amenitized buildings, quality schools and inviting neighborhoods. SilkLofts has been designed to receive LEED Silver Certification (Leadership in Environmental and Energy Design) and is being built in accordance with U.S. Green Building Council guidelines for developing high-performance, sustainable buildings. Among the green features are the use of bamboo flooring, energy efficient appliances and recycled materials. For additional information on SilkLofts, please call (201)-488-3926, email info@silklofts.com, or visit http://www.silklofts.com.